It might seem counter-intuitive, but eating a small snack of almonds mid-morning not only helps you feel less hungry at lunch and at dinner, but you will also eat fewer calories overall. Amazing? 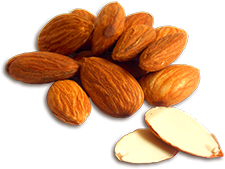 Dr. Roberta Re, a nutritionist, found that when people ate a portion and a half (1.5 ounces, or about 35 whole almonds) of almonds between breakfast and lunch, they felt fuller and more satisfied for longer1. There’s more good news about eating almonds as a snack. If you chew each nut 40 times, you will feel fuller longer, according to researchers at Purdue University2. When you chew, you break down the cell walls in the nut, releasing more healthy nutrients like vitamin E. Of course if you feel silly chewing so much, you can always use almond nut butter or make an almond-based smoothie and use tech instead of teeth to release the nut’s nutrients. 1 Institute of Food Technologists (IFT). (2013). The right snack may aid satiety, weight loss. ScienceDaily. 2 Almond Board of California. (2009). New almond study finds chewing is more than meets the mouth: Thorough chewing may influence feelings of fullness.